I recently returned from a wonderful trip to France. I spent several days for work in the south of France then met my wife in Paris for several days of exploring Paris. As soon as I learned I would be going to France I started thinking about trying to fit in a flight while visiting. I was excited about the opportunity to see Versailles and the sites of Paris from above. I had troubles locating fixed based operators or flight schools. So, I contacted PlasticPilot who is based in Germany for some advice. He suggested Air & Compagnie based at the Toussus le Noble airport near Versaille about 30 minutes from Paris. I reserved a safety pilot and a Cessna 172SP for an afternoon during my visit. My wife and I planned to tour the Palace of Versaille in the morning then fly in the afternoon. Unfortunately, the morning of our day trip to Versaille we woke up to a terentual downpour. But, as all pilots learn to do I did my best to not focus on the weather hoping it would clear in time for the flight. 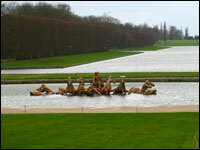 Sure enough while walking the grounds of Versaille the rain stopped and the closed began to clear. I started to think we would fit the flight in. Although we had a high enough ceiling and visibility the winds were in the 20 - 30 knot range and with 10 knot gusts. The problem is that the Toussus le Noble airport has two runways but they are parrellel to each other and the winds were directly perpindicular to the runways. I waited another 30 minutes after the initial flight time but the weather did not improve so I had to scrub the flight. I often say one of the hardest parts about being a general aviation pilot is the let down of having to scrub a flight. I look forward to visiting France again and will be sure to look up the friendly folks at Air & Compagnie. For now a flight in Microsoft Flight Simulator X will have to do. sorry to hear that you had to cancel. I'm sure you'll get another chance soon. At least now you know who to call. Merde. That would have been cool. 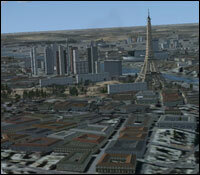 I'm guessing that FSX is a poor substitute for time in the air over Paris. Tony you are right that FSX was a poor substitute to the actual flight experience but I guess better than nothing. Wing and a Whim, I have no standard way to get over the let down of a canceled flight other than start planning for the next flight. Now that's really something u can get upset about. Hope u'll get another chance soon and can enjoy urself. Sorry to hear that you missed the chance due to bad weather condition. But I feel you would get chance very soon and will enjoy your trip. I think that to get the home loans from creditors you should present a firm motivation. Nevertheless, one time I've got a credit loan, just because I wanted to buy a building.